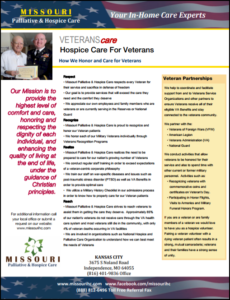 Missouri Palliative & Hospice Care partners with the Veterans Administration to serve our hero’s in their time of need. Missouri Palliative & Hospice Care has created Veteran-specific educational material and presentations to staff, volunteers and the community. The organization has also partnered with local organizations to collaboratively serve Veterans, and has participated in events to honor veterans in our service area. Missouri Palliative & Hospice Care demonstrates a sound commitment to serving our nations heroes. We have a commitment for improving care for Veterans. Partners, acting with us, can improve the quality of life for our Veterans, and using resources for providing end-of-life care to Veterans. By recognizing the unique needs of our nation’s Veterans who are facing a life-limiting illness, Missouri Palliative & Hospice Care is able to accompany and guide Veterans and their families toward a more peaceful ending. And in cases there may be specific needs related to the Veteran’s military service, combat experience or other traumatic events, Missouri Palliative & Hospice Care will strive to have the tools to help support those they are caring for. Missouri Palliative & Hospice Care will focus on respectful inquiry, compassionate listening and grateful acknowledgement, coupled with Veteran-centric education of health care staff caring for Veterans. America’s Veterans have served our country and we believe it is time to serve them. If you are a Veteran or active duty military personnel and would like to learn about volunteering for Missouri Palliative & Hospice Care please contact the office nearest you. Volunteers help Missouri Palliative & Hospice Care honor patients who are veterans by presenting special recognition such as certificates, coins and pins. These simple acts have a profound impact on Veterans nearing the end of life. Missouri Palliative & Hospice Care is an organization dedicated to providing the care and the comfort patients and loved ones need during times of life-limiting illnesses. Contact us today to learn the many benefits of the Medicare Hospice Benefit and the difference in care you will receive with Missouri Palliative & Hospice Care!